A heavenly dessert for a hellishly hot day. We’re getting a taste of the mid west summer heat as Portland settles into a stretch of 5 days hovering between the 90s and 100s. I’ll only whine a little as I know friends and family back in IL would scoff at our measly 5 days after they’ve suffered weeks of these kinds of temperatures. I made this delicious torte yesterday for a fun BBQ across town. Across town, for anyone that’s read FYS for awhile, knows this means I either walked or took public transportation of some kind as we are on our 2nd year of being car-less. Due to the fact that I would be schlepping the dessert this distance, I had the brilliant idea to NOT assemble it until I arrived. 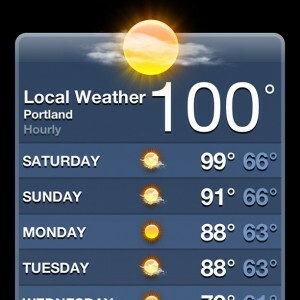 I knew it was going to be hot, but I never checked in with any of my weather apps or sites before I left the house. It was hot and it wasn’t until I walked the mile downtown that I checked in to see that it was a whopping 100F! 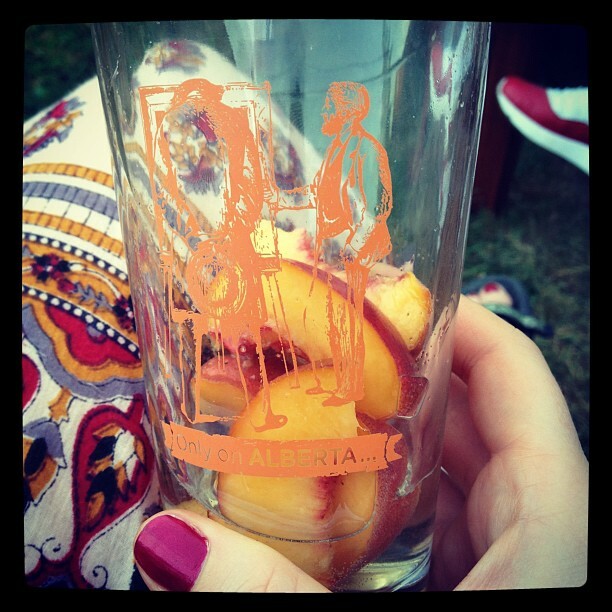 So grateful I was wearing my beloved hippy skirt, tank top and tevas. Since I am of the breed that never sweats, just turns red, I was completely surprised to find sweat running down my arms and my legs. Gross. Thankfully the bus was mostly empty and air-conditioned. A great relief indeed. 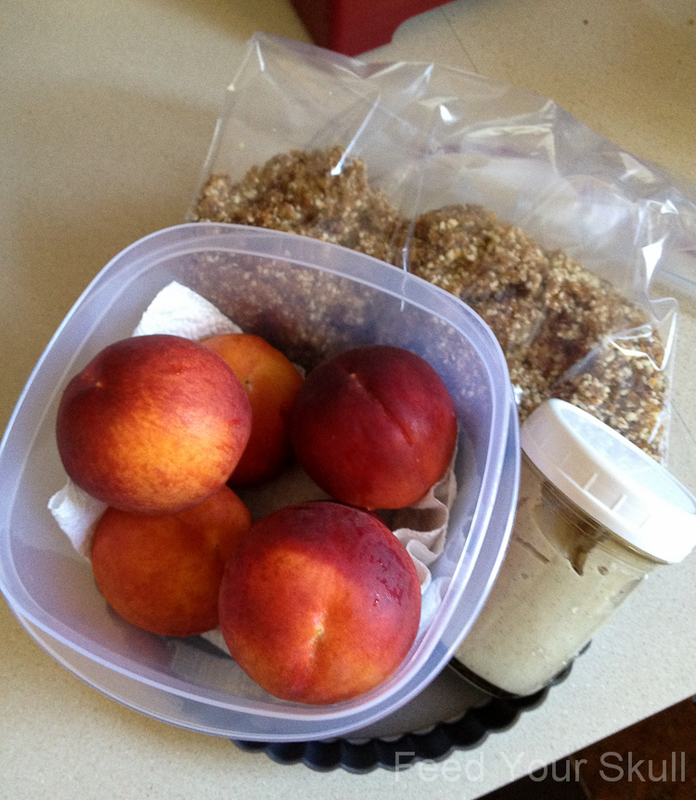 So, I made all of the ingredients and placed them in containers suitable for travel. 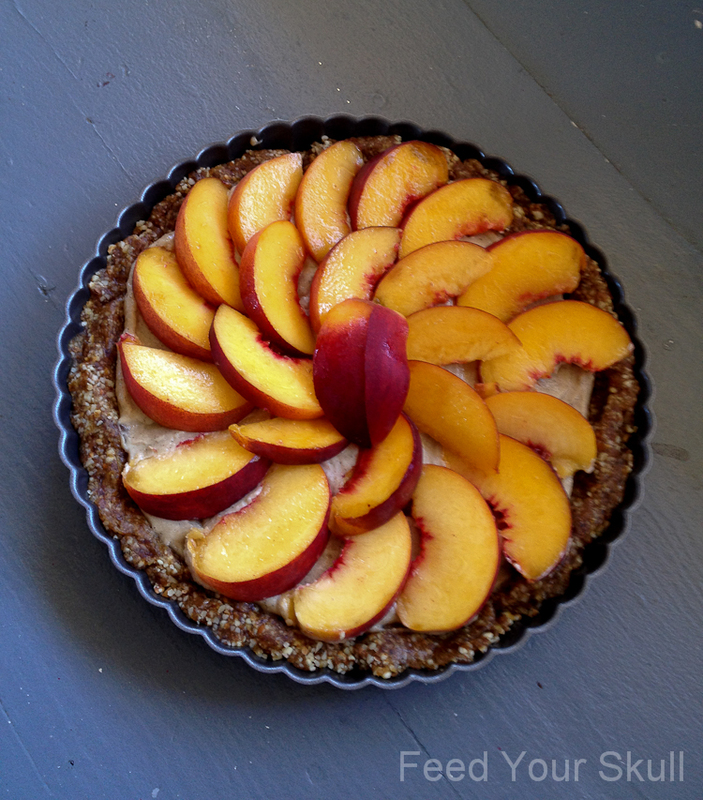 It was perfect and the peaches stayed un-bruised and lovely. Rack ’em up! 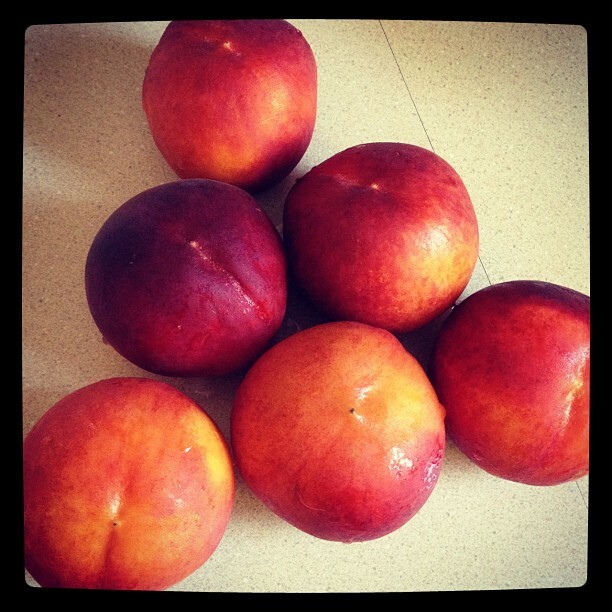 It’s true, I have been a little obsessed with peaches lately but they are in season and at good prices right now. Pre-assembly this torte took less than 15 minutes to put together, as I did it right before I left (not counting the soaking time for the cashews of course) and probably another 10 minutes of assembly. Here’s the making of the crust. The recipe developed in my imagination as they always do. I wanted something delicious and filling but also refreshing! As I started to make the crust I eyed my recently purchased 1lb of curry powder. What was I thinking a POUND of curry powder? I just know it is the only spice I’ve run out of twice in the last year. I kept thinking, ‘Mmm curry and peaches, that sounds really really good!’ countering with ‘No, you’re crazy!’. Curry won out and was added along with cinnamon to the crust and I have to say I’ll be making this combo again for sure. If you’re serving it to folks and you’re not sure of their level of curry adoration, the 1/2 teaspoon is perfect. Blended with the cinnamon and dates, it brings a truly unique perspective to a dessert but is also mellow enough to be subtly detected. If you are a fan of curry, I say add a dash or 1/2 teaspoon extra, as this is the goal for the next time I make it. The vanilla cream turned out perfect and is beautifully speckled from the vanilla bean powder used. Feel free to sub a pure vanilla extract instead. I wanted this to be able to serve many people, so I cut it into 16 slices, adjust as needed. Place ingredients in a blender or food processor and blend until smooth. I used my Blendtec Twister Jar and it took about 35 seconds without need for additional water. If you're using a regular blender/food processor, add water by tablespoon if needed as you stop and scrape down the sides in between blends; this can take between 5 and 8 minutes. 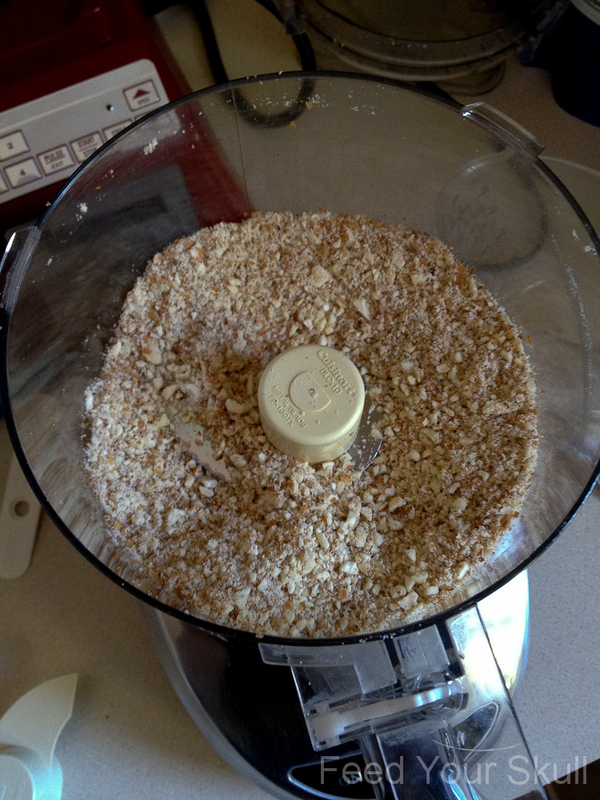 I used a 20 year old blender once and it can do the job, just at a slower pace. Set aside. 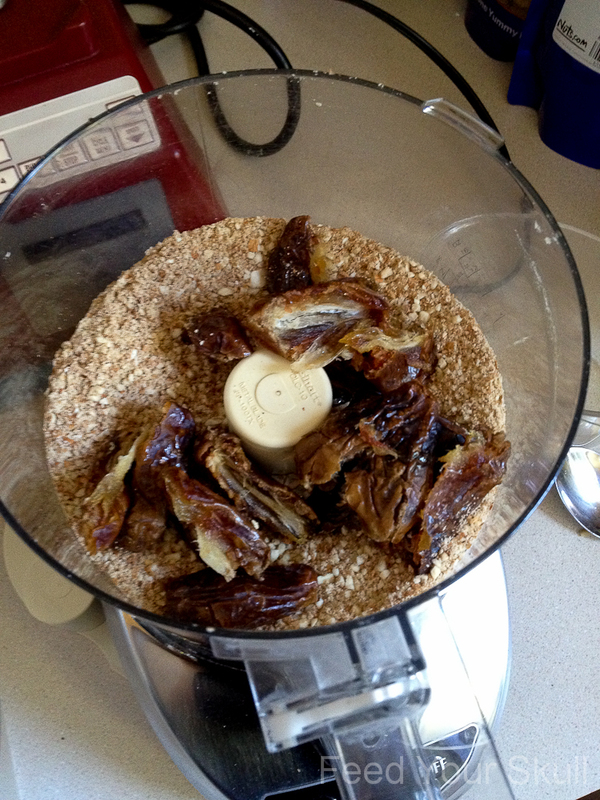 Place almonds, curry, cinnamon, and sea salt in a food processor fitted with the s-blade. Process into small pieces. Add the dates and process until the mix is incorporated and starts to fall towards the center of the processor. If you can pinch it between your fingers and it holds shape, it is ready to go. Evenly spread the crust out in a 9-12" torte or cheesecake pan, pressing with clean hands or a spatula to create a flat surface with raised edges along the side. If you'd like a thinner crust, reserve some of the 'crust' and shape into bars for a great workout snack. 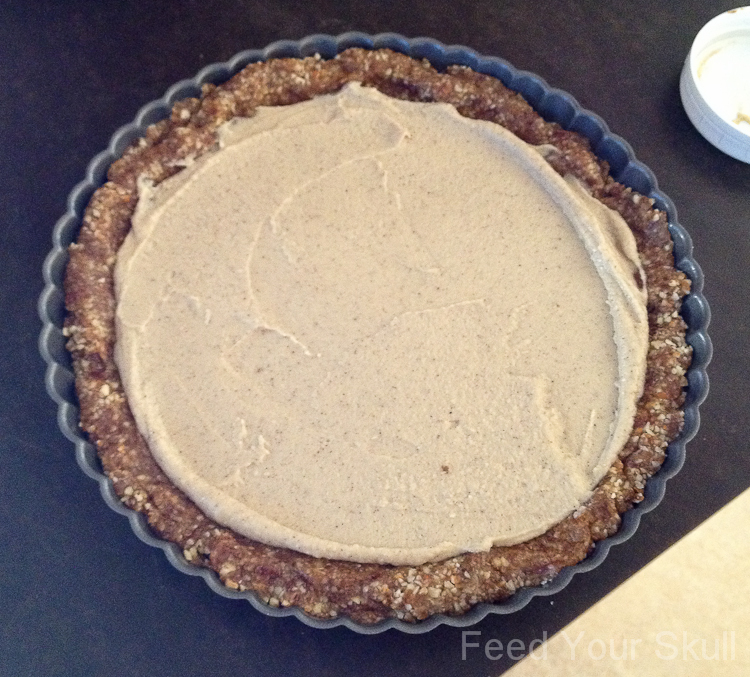 Next, spread the vanilla cream filling over the crust with an offset spatula. 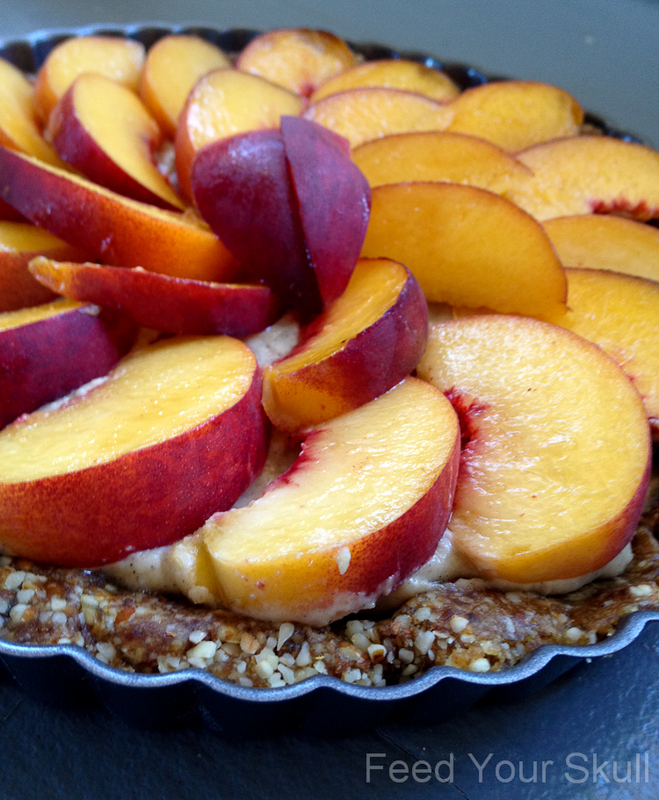 Lastly, top with freshly sliced peaches. Serve chilled. Any leftovers should keep in the fridge for a few days or pop in the freezer for cold summer treat! I hope you enjoy and I’d love to hear how the curry delighted you.